You studied Philosophy of Religion at the Sorbonne, but what drew you to sculpture? I actually discovered both at the same time when I was seventeen — my room had philosophy books from floor to ceiling and there were clay maquettes everywhere. Then I had to choose a University. The natural choice would have been the Academy of Fine Art but I wasn’t interested in studying mark making and have nothing to say in my art. So I went to study Philosophy and left the arts to read books for seven years. I felt it was necessary to understand the world before you attempting to represent it. How did you get into sculpture, did you study or pick it up independently? When I was studying philosophy at the Sorbonne I was walking down the street after a class towards the Academy of Fine Arts in Paris. There’s this old Amphitheatre where the great anatomist, Paul Richer, taught and there’s a vast collection of crocodile skeletons and elephant skulls. Whenever I had free time I went to the anatomy lessons there, trying to reconstruct the human figure, bone by bone, muscle by muscle. I also spent an enormous amount of time at the Rodin Museum, which helped. But I was an emotional sculptor, not a technical one. It was only when I studied with Robert Bodem that my technique skyrocketed. But strangely enough I managed to have important commissions of sculpture in Paris and Los-Angeles before I got any training. 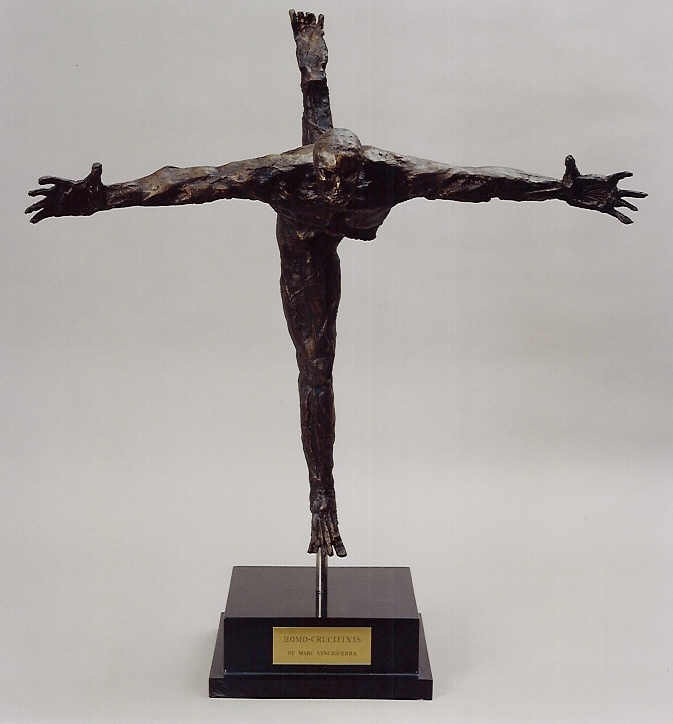 My first figure I created, Homo-Crucifix, was sold to five private collections and won the election for the annual show of the National Art Club in New York. One of the materials you use frequently is bronze. What attracts you to bronze and what do you look for in the materials you use? I have done a lot of Bronzes both in Los-Angeles and Paris. In Los-Angeles I was bringing my sculptures to be cast and saw a bust of Frankenstein on a shelf. I asked what it was and the foundry workers told me that the daughter of an actor who played Frankenstein in the Forties cast her father’s face and never came to collect it. I’m attracted to bronze because it has a presence, almost a human presence, and it is very solid. I also use a lot of marble. I was trained in the Carrara Mountains where Michelangelo sourced his marble and I look for its sense of light. While brass reflects light, marble radiates light from inside and it is this difference between these two mediums that I cherish very much. What role does figurative sculpture play in the art world today? Today it is important to recognise that we don't know what art is anymore. I feel there are two major movements, contemporary art, which wants to be new without connecting with the history of humanity, and realist art that wants to be old without connecting with the future. In my opinion, neither of these movements are art. In a way there is not much difference today between the urinal of Duchamp and a perfect realist painting as they both avoid the question of the essence of man. But to see a perfect realist painting today that could tackle this question then you would have a masterpiece. An artist who could do that would have understood that art is no longer about the evolution of form but the evolution of content. Which artists do you most draw your inspiration from? When I was a teenager growing in Paris and had a bad week, I would take the Metro to the Museum, climb the fences and look at the Rodin statues, sleeping in the moonlight. It would calm me. Years later I founded Post-Contemporary Sculpture, an organisation that seeks to expands the heritage of Rodin in the 21st century. Through my organisation I organise some of the best sculptors working today who are carrying his mantle. I also greatly admire Francis Bacon . He depicted the essence of man in his own time. I find his painting perfectly honest and very sculptural. Francis Bacon is beyond genre though, he is a realist and is not at the same time, but his figures are in unity with a temporality and that makes him great artist.